What's the definition of insanity? Trying the same thing several times and expecting a different outcome. While we wouldn't suggest that Microsoft's finest minds are in need of urgent medical care, it does seem as if the company's executives have failed to heed the lessons doled out this summer. After all, it was only a few months ago that Microsoft had to admit that very few Surface RT tablets had been sold, and booked a $900 million loss on inventory that remains rotting in warehouses. 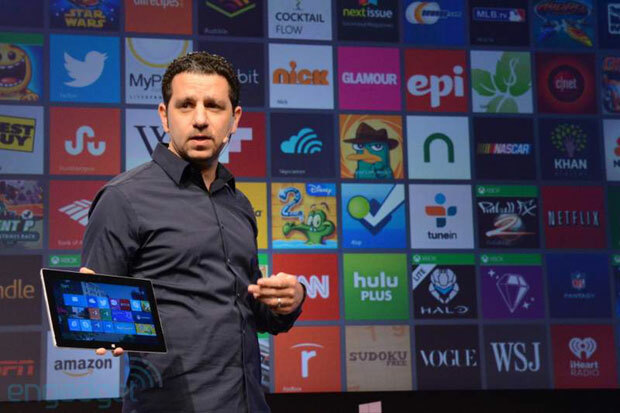 At today's launch of Microsoft's second Windows RT-running slate, Surface chief Panos Panay opened his remarks by saying that the "Surface 2 is not subtle, but is a revamp. It is not the simple changes that everybody wants, but it's the changes people need." Unfortunately, the changes that he then went on to describe involved making the device thinner, faster and giving it a full-HD display -- criticisms that few had leveled at the first generation of the hardware. No, the problems that every critic had were the limitations of the Surface's operating system: Windows RT. Not that you'd know it from today's event. In fact, Microsoft went out of its way to downplay the fact that the Surface 2 runs RT, mentioning the ambitious Windows-on-ARM project only three times in an hour. But why was the star of the show reduced to such a bit-part role? 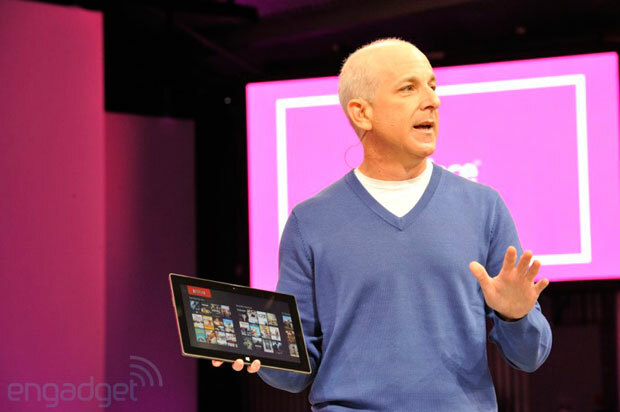 It was 2011 when former Windows chief Steven Sinofsky told the world that Windows was coming to ARM-based hardware. Even though the company began sketching out ideas for Surface in 2009, before the advent of the iPad, with hindsight, it seemed a prescient move. Windows and Office, two of Microsoft's biggest cash generators, both ran almost exclusively on x86 systems -- desktops and laptops -- while ARM's low-power chips were beginning to hoover-up the rapidly growing smartphone and tablets. Unfortunately, there were a number of compromises that hobbled the new platform's chances before it was even completed. Back in 2011, Intel's Renee James admitted that Windows on ARM (as Windows RT was then called) wouldn't be able to run "legacy applications." In short, any program that ran on previous editions of Windows would have to be re-written from the ground up to work on the new architecture. Intel, understandably concerned about cutting itself out of the market, refused to offer emulation support for the new platform -- but that meant consumers would have to buy new versions of any programs they wanted to run on RT, assuming those programs were even available. In June 2012, when Microsoft announced that it was creating its own hardware to accompany the operating system, the company's hardware partners instantly poured scorn upon the project. Acer's Linxian Lang said Microsoft would have to eat "hard rice" if it persisted with the plan. HP's Todd Bradley was skeptical, saying that he "wouldn't call [it] competition." While many interpreted his comments as a defensive response from an aggrieved hardware maker, it seems as if his prophecy came true. Acer originally planned to produce Windows RT hardware, but, along with Hewlett-Packard, pulled out in mid-2012. Even Apple CEO Tim Cook, who rarely criticizes other manufacturer's products by name, described the Surface as "compromised, confusing." At the Surface's launch, Microsoft insisted that the tablets represented a pair of "no compromise" devices, but there was another "C" word that seemed to hang around the event: confusion. At the Surface's launch, Microsoft insisted that the tablets represented a pair of "no compromise" devices, but there was another "C" word that seemed to hang around the event: confusion. You see, the company had already used the Surface name on a range of touchscreen tables (since re-named PixelSense) and while it was releasing two tablets under this brand, the duo only behaved in the same way on the, ahem, surface. Surface with Windows RT was powered by an ARM-based NVIDIA Tegra 3 T30 system-on-chip with 2GB RAM. As we've already stated, this device ran Windows RT, which, although it looked and felt like Windows 8 -- even down to the ability to run a traditional "desktop" mode -- was entirely incapable of running legacy applications. This meant that previously owned editions of software wouldn't run, despite this appearing to operate like your average Windows 8 PC. While the Surface RT was launched on September 26th, 2012, its sibling wouldn't arrive on the scene until February 9th, 2013, nearly five months later. Though the Surface Pro looked like a slightly fatter Surface RT, it was built around an entirely different platform: an Intel Ivy Bridge Core i5-3317U running at 1.7GHz with 4GB RAM and running Windows 8 -- making it a full-fledged Windows device, capable of running all of the software the Surface RT couldn't. Price-wise, the Surface RT retailed for $499 to $699, while the Pro was marked up between $899 and $999. This time out, the company has sought to put clear blue water between the two models, with the Surface 2 launching for $450, and the Pro 2 starting at $899. Despite the controversy, Microsoft did manage to convince some of its partners to produce hardware that ran its nascent platform. Samsung (ATIV Tab), Dell (XPS 10), ASUS (VivoTab RT) and Lenovo (Yoga 11) all contributed devices that ran Windows RT. Unfortunately for both Microsoft and its partners, when the gear made its public debut, reception was lukewarm and several manufacturers tried to put the genie back in the bottle. Samsung famously canceled the ATIV Tab's US launch, citing concerns that customers would be confused between Windows RT and Windows 8 -- since both looked and operated the same way, yet were almost completely incompatible with each other. Of the others on that list, only Dell's XPS 10 remains on sale, with ASUS taking a hit on unsold VivoTab RT units and Lenovo quietly retiring the Yoga 11 from its website. Paul Thurrott, Supersite for Windows: "Any excitement Microsoft generated around this launch will be squandered when people realize they just bought something that looks like Windows 8 but comes with even fewer apps than Windows Phone. That's not a recipe for success, it's a recipe for disaster." Tim Stevens, Engadget: "If gaming and music and movies and reading are what you're looking to enjoy, then we might advise sitting this one out for a few months." Walt Mossberg, The Wall Street Journal: "If you can live with its tiny number of third-party apps and somewhat disappointing battery life, it may give you the productivity some miss in other tablets." Nine months after launch, and with the Surface RT quickly becoming a singular product in the Windows RT market, Microsoft decided to slice $150 from the price in the US and similar amounts elsewhere. Not even the Surface Pro, which shared little in the way of common features, was immune from the need for a price reduction, and Microsoft cut $100 from its price just a month later. Microsoft may define the new hardware as a "revamp," but in real terms, this is the sort of spec-bump you would likely expect from any annual tablet refresh. In July 2013, a year and a month after Microsoft launched Surface RT, its quarterly financial report revealed that it wrote off $900 million worth of inventory. More than a week later, SEC filings showed that both versions of Surface brought in $853 million -- less than the $898 million that the company spent on advertising the platform. Microsoft has yet to announce how many Surface units it sold, but simple long division -- assuming customers only ever bought the $499 base model -- shows that, over the course of a year, it sold a paltry 1.7 million Surface devices. By way of comparison, Apple sold 14.6 million iPads in the third quarter of 2013 alone. Analysts like Patrick Moorhead believed that this loss was the final straw for Microsoft's senior figures, who demanded Steve Ballmer take the fall for the project's failure. While the CEO is unlikely to ever openly comment on the decision, his public remarks in the press release announcing his retirement do offer some hint as to his thinking. "My original thoughts on timing would have had my retirement happen in the middle of our company's transformation to a devices and services company." Naturally, as that transformation would have taken several years, we can take this to mean that he was pushed by a board at the end of its tether. Then there's a rumored quote taken from an internal "town hall" meeting, where the executive reportedly said that he had "overestimated" demand for Windows RT tablets. 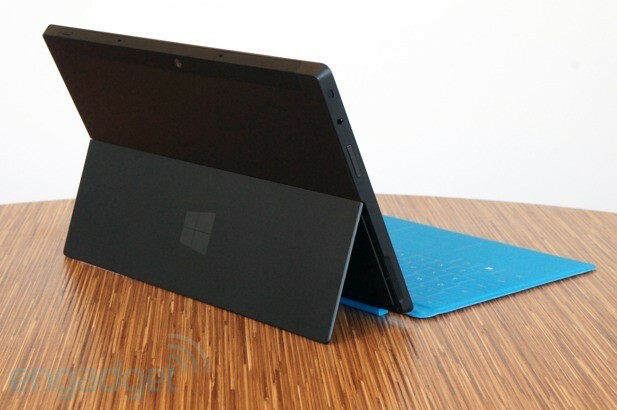 Today, of course, was the launch of the Surface 2. In the new product lineup, Microsoft is keeping the Surface RT around as an entry-level option, so it's easy to compare the first generation of the device alongside its sequel. Microsoft may define the new hardware as a "revamp," but in real terms, this is the sort of spec-bump you would likely expect from any annual tablet refresh. That means that the Tegra 3 of 2012 has been replaced with Tegra 4; the USB port has been upgraded to 3.0; and the 10.6-inch display is now full HD. The cameras have also been tweaked, with a 3.5-megapixel front-facer complementing the 5-megapixel primary unit. Oh, and, as with last year, the device also comes pre-loaded with Office RT. In many ways, Intel's stumbles in the portable market were one of the reasons behind the genesis of Windows RT. The chip maker wasn't able to blend performance and power for its mobile offerings, typified by the Surface Pro's sub-four-hour battery life. Microsoft, therefore, needed a long-life and low-power offering to help bolster its range. Unfortunately, by the time that Surface RT had launched, Intel was on the cusp of turning itself around. It had its Atom-branded Clover Trail processors, offering full Windows 8 in relatively cheap and low-power (sub-3W) hybrids. Crucially, it also had Haswell -- a full-fat chip that managed to reduce power consumption to beneath 15W, with laptops like the MacBook Air and Sony VAIO Duo 13 getting nearly 13 and 10 hours of battery life, respectively. These systems, capable of running fully featured operating systems, essentially rendered the notion of a crippled, tablet-only version of Windows obsolete in a heartbeat. Intel's next advance, Bay Trail, the successor to Clover Trail, can only make things worse for RT. Lenovo, a company that had supported RT by producing the Yoga 11, neglected to refresh the device at its September press event. Naturally, an enquiring audience member asked if we would see the company create a second Windows RT device and marketing manager Nick Reynolds' response was telling. He said that with the advent of Haswell, the old compromise between power and performance was moot -- and, by implication, that we'd probably not see any more Windows RT devices from the company in the near future. Now that the Surface Pro 2 has Intel's Haswell technology on-board, promising 75 percent better battery life, the presence of Windows RT 8.1 on the Surface 2 seems like an aberration. Yes, the Surface 2 may run "100,000" apps available in the Windows Store, but if you purchased a new x86 copy of Photoshop even a year or two ago, it won't run on this device. One of the problems with the first generation of Surface tablets was that people reportedly stayed away from the platform purely because there was an uncertainty surrounding app compatibility. By way of comparison, there are around 275,000 iPad-only apps and an unspecified number of tablet-optimized Android apps, believed to be around 60 percent of the nearly 900,000 available -- giving a ballpark figure of 540,000. Combining a smaller app selection and no legacy support (despite the confusing presence of a desktop mode that could dupe many into believing that this is a full-fat Windows 8 device) means that there is still uncertainty here. While Microsoft has hoped that a small price cut and improved specifications will dazzle the market, the gnawing hole at the heart of Windows RT remains. With no other manufacturer, as yet, on-board to produce new Windows RT hardware, Microsoft will have to plough this furrow alone -- and judging what has happened over the past year, we're not sure it's capable of engineering a turnaround.